The race for the White House may seem like a marathon, but the nomination process is becoming a sprint, with the starting gun fired earlier each time. Where state primaries and caucuses were once spread out over a period of three or four months, most are now crammed into a four or fiveweek interval at the very beginning of the delegate selection calendar. The compression and hastening of the nomination season are changing the nature of the presidential selection process, the most visible pillar of American democracy. Despite the importance of this issue in American politics, however, too little systematic analysis has been done on the topic. This is the first book to offer a comprehensive examination of the front-loading problem in all its facets. William Mayer and Andrew Busch define the parameters of the front-loading question as well as its impact. They trace the history that shaped the current system and explain why it is such a critical element of presidential elections. Most important, the authors present a detailed analysis of all the major proposals for coping with front-loading and of the political and constitutional obstacles for reform. While they conclude that there is no easy solution to this complex issue, they identify a general direction for reform efforts. They also feel that the political parties should be the prime movers in formulating and implementing changes. William G. Mayer is associate professor of political science at Northeastern University. 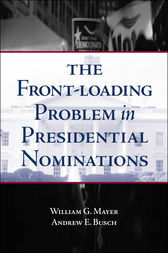 His books include The Making of the Presidential Candidates 2004 (Rowman and Littlefield, 2003). Andrew E. Busch is an associate professor of political science at the University of Denver. He is the author of Outsiders and Openness in the Presidential Nominating System (University of Pittsburgh Press).